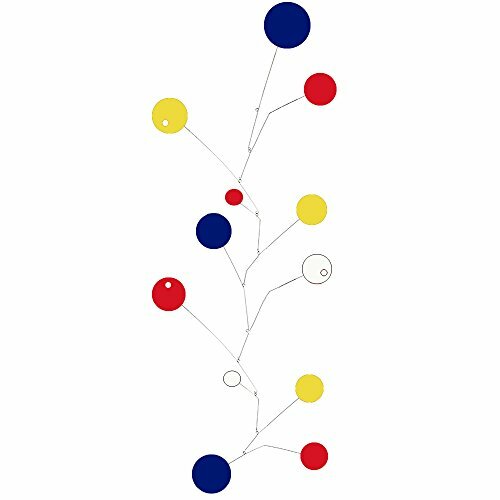 "Space Age" is a delightful hanging art mobile inspired by Alexander Calder and mid century modern style, long and narrow shape is perfect for entryways and stairwells. Navy blue, red, yellow, white colors. I take inspiration from Calder and create a new and unique kinetic art sculpture for your home or office. The long and narrow shape makes it perfect for your entry way or stairwell, or anywhere you need a long narrow piece of art. Whimsical abstract shapes dance in the slightest breeze. Includes simple instructions, strong nylon line, two "S" hooks, and an eye hook for hanging from ceiling. No assembly required. If you love Atomic Ranch magazine, 50s retro, Eames, midcentury modern, Blenko glass, Knoll, feng shui, danish modern, mod -- and everything in between -- you will love this art mobile! Want different colors? Yep I can do that at no extra charge - see Color Chart above. Bring beautiful color and calm zen-like movement to your space. Available in 3 sizes - click "Select Options" in the gray box to the right then click Add to Cart. If you have any questions about this product by Atomic Mobiles, contact us by completing and submitting the form below. If you are looking for a specif part number, please include it with your message.